13 inch commercial Decorative Lighting! This is the REAL STUFF. 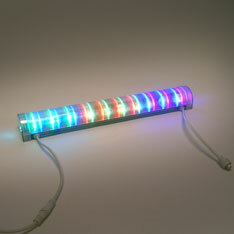 Made from durable impact diffused plastics with 110V AC bright LED blinking, chasing light-bar accents! Perfect for display cases, framing accents, window dressings! Light bars come with two mounting brackets, 110V AC plug and 7 inch “daisy-chain” connector for adding more lengths. Boxed and sold separately. $19.25 each for 6 or more. $16.95 each for 12 or more.